AmiQure Omega 6 provides support for sensitive or irritated skin, hair problems, hair loss, nutrition and skin protection. Many scientific studies have shown that the skin of humans and animals benefits greatly from Omega-6 fatty acids. The active substance of Omega-6 is Gamma Linolenic Acid (or GLA). AmiQure Omega 6 contains the purest form of evening primrose oil, with 33% more GLA than other evening primrose oil preparations. Factors determining the quality of the oil include its origin and purity, but also the process by which it is extracted. Since the essential fatty acids are very sensitive to oxidation (rancidity), the most widely used form of administering a dose is via a capsule. Processing these fatty acids with the food is not advisable, due to the possibility of oxidation. 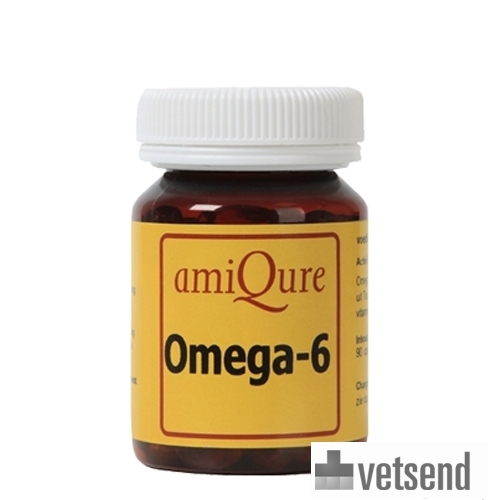 AmiQure Omega 6 capsules have been successfully used by veterinarians for many years. They feature a strong combination of amiQure-Derma and amiQure Omega 6. Administer 1 capsule per 30 kg of body weight; at the start of the course administer 1 capsule per 10 kg of body weight for 12 weeks. Have you used amiQure Omega 6 before? Let us know what you think about this product.